Bird's Nest Cupcakes- Bake cupcakes and top with store-bought coconut frosting, then toasted coconut to make the nest, and three little Cadbury Mini eggs in the center of each. Couldn't be easier. Just spread coconut on a cookie sheet and put in the oven for a few minutes until it is nice and brown. Watch it, though, because it can burn very quickly. Easter Pie - I found this one on Food Network - one of Giada's recipes (Love her!) It is like an rice pudding/egg custard in a flaky philo crust. A delicate flavor. So yummy, and so very pretty! Here is the link to that recipe. Lamb Cake - I have had this lamb shaped cake pan for years, but was intimidated by it. Last year I did this, and I thought it turned out darling. I baked a devil's food cake, and piped on vanilla frosting in big loose swirls everywhere but the face and ears. I sprinkled green coconut "grass" all around her. The flowers are made from large marshmallows that I snipped in half with scissors and sprinkled with colored sugars which only sticks to the cut parts. The leaves were made the same way. The centers of the flowers were more of the chocolate eggs from the Nest Cupcakes. Very easy and such a pretty way to finish off our Easter meal! I am so excited! Easter Week is here, at at our house, Easter is a week-long celebration. It seems like it has popped up so early this year! I'm not quite ready for it, but I am getting it all together. Click Here to get a rundown of what our family does each day of the week from Palm Sunday to Easter Sunday. The particularly special activities are on Sunday where we reinact Christ's triumphal re-entry with palm fronds, Thursday, when we have a special Passover dinner, and Saturday night, when we prepare for Easter Morning with our Easter Story cookies. The recipe is included in the post that is linked above. Then, on Easter, among the regular Easter festivities, we also have a tradition of telling The Easter Story in Eggs, which is also in that same post. All of the traditions that we enjoy during that entire Easter Week really help my children grasp the true meaning of this most sacred and joyous of holidays. Of course, we still make time to color our eggs and bake and have egg hunts too, and I will post some fun recipes, projects, and such in the coming week, maybe even more details about our passover meal. Happy Easter Week all you attic dwellers! 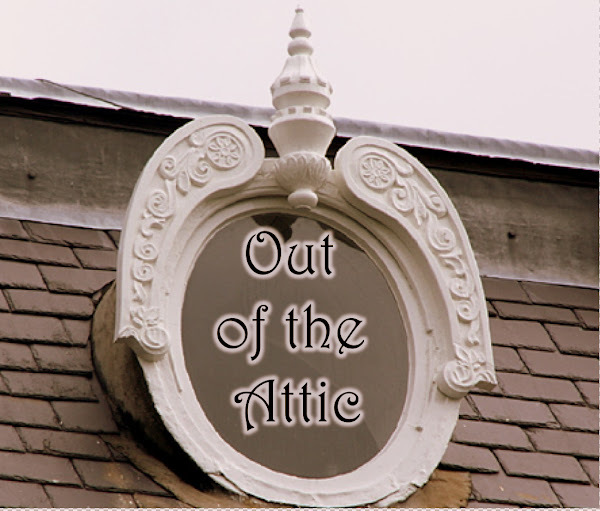 First, my apologies for letting things slide on the Attic lately. I have a good excuse. If you are familiar with LDS lingo I can sum up why I have been so crazy busy in one word: roadshows. If you are not, then just know that my life has not been my own, (or my family's) for the past several weeks. But now that things are back on track, I have been slammed with the thought that Easter is quickly sneaking up on us and I have so much I want to do for Easter! Oh my! So I got around to some fun stamping projects for Easter. I LOVE this sweet little lavender basket that I made using my Bog Shot Baskets and Blooms die! It is so cute and really a lot easier than it looks. The sweet little bunny is from my new Forest Friends set with sweet retro animals that remind me of our friends in Bambi. The back side. The die also cuts out the flowers and the band around the middle. They would be sweet Easter favors filled with a little candy or a couple eggs. My favorite new stamp is the Chocolate Bunny that I used to made this delicious double opened card. I embossed the bunny in brown on brown paper to give it the look of a shiny chocolate bunny. It is hard to tell from the picture, but the egg has been embossed in a harlequin type pattern, and the card is really quite charming. For more cute I made these fun bunny bags using a variety of punches. The bunny's head is a flap that you open to get into the bag. So cute! Speaking of punches, her is a tiny little lamb that I made last Easter, in case you missed it, also using a variety of punches. I love punches! Click here to see some other stamped spring projects I posted last year. That's all for now, but stay tunes for more Easter fun! Have an Occasion? Need a cake? Look at these beautiful cakes. They are not only beautiful, they are delicious too. Our cute friend, Michelle Valdez, is just starting a cake making business. Got an occasion you need a cake for or want to just send something fun to a friend? She can make them most any theme, shape, size that you need. Need an idea? She'll help you with that also. I know I'm already thinking of an occasion, how about you? Call Michelle at 760-403-6311 or send an email to chikadee0610@msn.com if interested. While I do realize that Valentine's day is over, I also know that, blessedly, chocolate is always in season, and we really shouldn't have to wait for Christmas or Valentines to have a reason to spend a day up to our elbows in warm and silky chocolate. At least I, for one, don't need a reason. Shari is an excellent chocolatier, and I was so excited to get to study under the master. She made the fondant for the centers the night before. Apparently that is quite a labor intensive process, but I was not there for that. I came in the morning, when the hard part was deciding what flavors to make the basic fondant. We divided the fondant and began to experiment a bit. In the end we came up with toasted almond in milk chocolate, mint in milk chocolate, toasted coconut in milk chocolate, and cranberry orange in white chocolate. I also brought to the table my signature Oreo truffles in dark chocolate. We also wanted to make caramels, and chocolate dipped pretzels, but, alas, ran out of time. Once our centers were all mixed and rolled we were ready for the fun part - the CHOCOLATE! Shari taught me all about how to bring it to temperature, or temper, the chocolate properly. We melted most of the chocolate in the microwave until it was melted, stirring often. Then we added more room temp chocolate to bring down the temperature. If you are not sure if the chocolate is cool enough, put a bit of it on your upper lip. If it is even a slight bit warm, it is not ready. That was my favorite part! I must say, we looked quite smart in our chocolate mustaches! 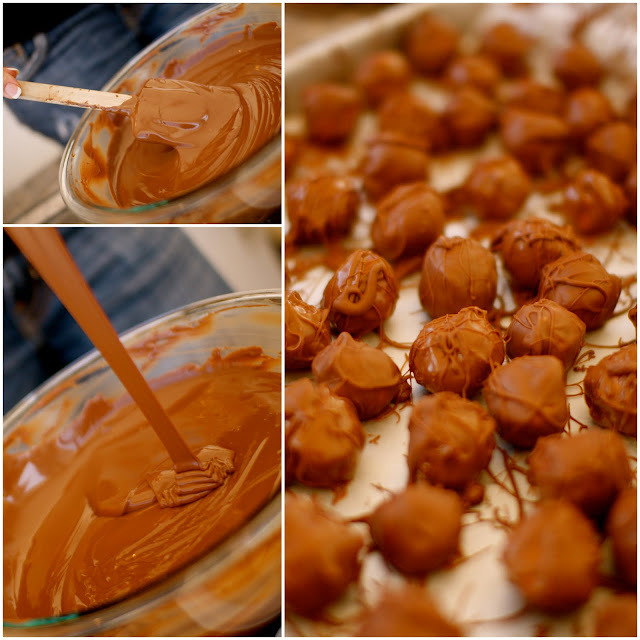 Shari taught me that the only way to properly dip chocolates is by hand - literally. The whole hand goes into the chocolate, scoops up a palmful, then the center is dropped by the other "clean" hand into the chocolate laden palm where it rolled around single-handedly until it is perfectly coated in the sinful stuff. Then the "chocolate" hand carefully sets it on the parchment-lined tray. That part is a bit tricky because you want to make it look just right. 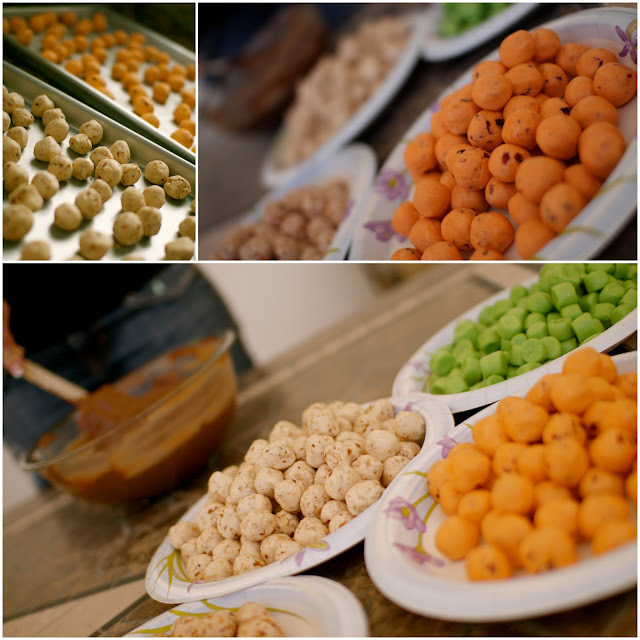 It is quite the assembly line, but a heavenly one, I must say! Dipping chocolates is a very sensory rich experience: the thick, sweet smell, the velvety brown color, and the feel of the smooth warm wet chocolate - everywhere! Oh yes, and it tastes good too! We drizzled the coconut ones in with wisps of white chocolate, and the mint ones we made extra small, drizzled in a green tinted chocolate, and doubled them up in the paper cups. 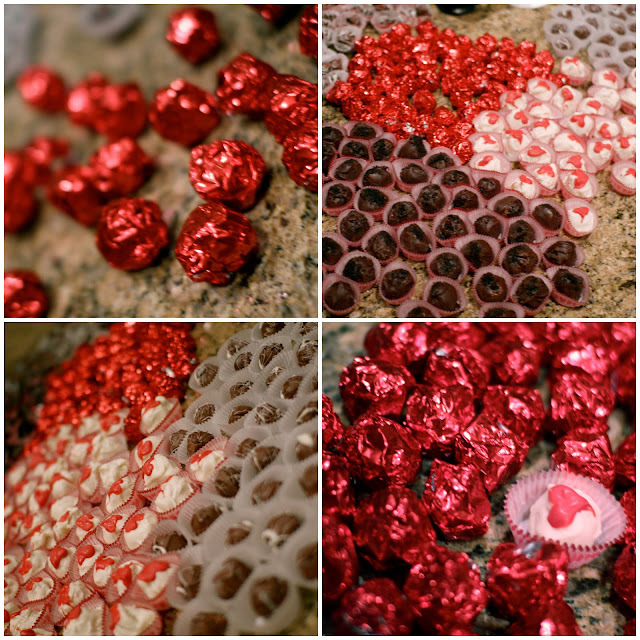 The Oreo truffles were sprinkled with crushed Oreos, and the orange cranberry white chocolate truffles we topped with little red hearts we painted on with our fingertips! The almond ones we wrapped some in festive red foils. We ate the ugly ones, of course. 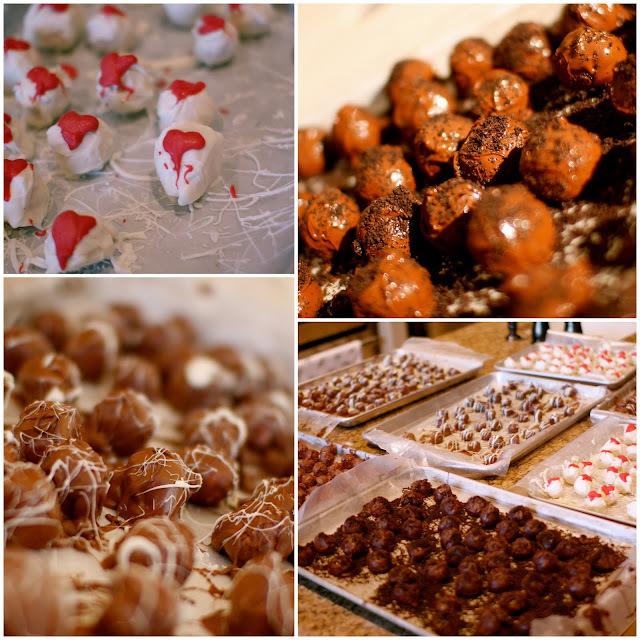 In the end, I can't tell you how many pounds of chocolates we made. Let me just say it was enough to cover a very large kitchen island! 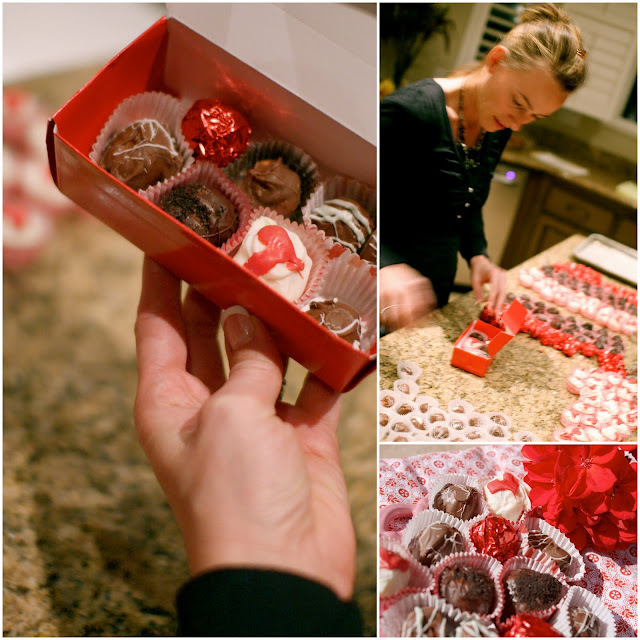 Then we packaged our assorted chocolates! They were utterly divine! 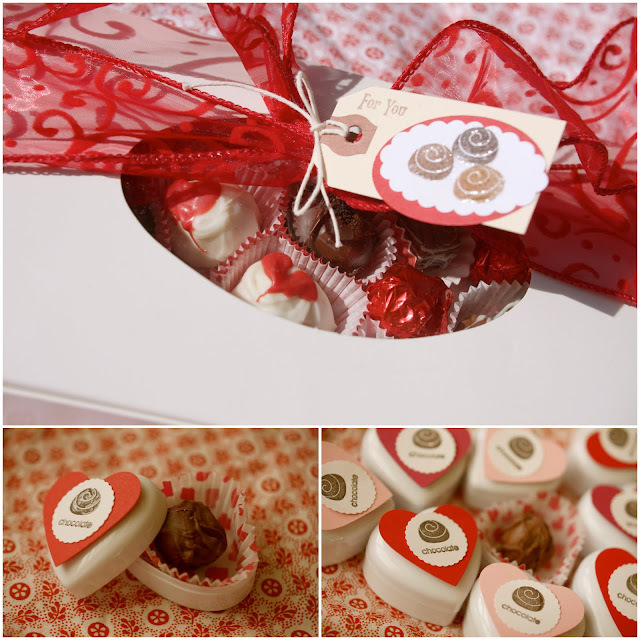 I stamped cute little tags with embossed chocolates for the boxes that I tied with a big ribbon. I also found these darling tiny white heart boxes in sets of 8 at the dollar store for individual little chocolates! I just topped them with punched hearts and more embossed chocolates. The girls loved them! What a fun day! Thanks Shari! I learned so much. (And I firmly believe that the more you know about chocolate, the better!) This will have to be a Valentines' tradition, I think. A day with friends and chocolate is a day well spent! But don't wait for Valentines day. I think St. Patty's Day is a perfectly good reason to dip chocolates, don't you? in a land far, far away there lived a princess..., well, actually about a dozen of them. I have mentioned before, that I am over the girls age 12-18 at my church, and every year we start off the year with a special evening called New Beginnings where we introduce the scripture theme for the year, as well as the new girls who will be entering the program in the upcoming year. on a castle card I made using the Big Shot and a castle die. They looked just like the slate roofed chateaus we saw in France. So fun! I utilized Attic Gal Alysa's Vinyl lettering business to make these blocks with this year's theme for the girls. I just used a glittery blue metallic spray paint, them stamped the Medallion stamp in black before applying the letters. Darling! One of the speakers read "The Paper Bag Princess" as part of her presentation. It was perfect! When my boys asked me what I was doing I told them I was making a castle. They looked at me like I was nuts. "Why?" "Because I want a castle. Every princess wants a castle!" They just rolled their eyes at their silly old mom. But it's true. I do want a castle. Preferably one in France. But what really caught the eye of every princess in the room that night was not a handsome prince, but a handsome cake custom made by my friend Michelle Valdez, who is starting a cake business. It was a big cake, and absolutely DARLING! Everything is completely edible! It really was the show piece of the whole evening! Nobody wanted to cut into it, yet everyone wanted a piece once it was cut. Rightly so! It was amazingly delicious!!! Homemade chocolate cake with an almond cream filling. I really didn't expect a cake that looked this good to taste this good! I knew to ask Michelle to make our cake after seeing the cakes she made for our church Valentine's dinner (she made about 10 of them for that night!) It was a fabulous rich red velvet cake. RED VELVET, ladies! If you need a special cake for that special occasion, and you like local, let me know. I'll hook you up! Needless to say, that cake went a long way in helping all the princesses live happily ever after!